Welcome to the 25th issue to subscribers of Right Writing News. If you are reading this issue forwarded from someone, be sure and use the link below to get your own free subscription. Some times other writers are surprised about what I read and where I learn more about publishing. My work is primarily in the spiritual/ inspirational/ religious/ Christian marketplace for the majority of my writing. You can pick your label but if you look at what I've written it's pretty obvious from most of my writing such as Teach Yourself the Bible in 24 Hours. Because of my journalism training, I continue to learn from many different places. There is a fairly constant theme from the lives of many well-known and lesser known writers: each one has overcome some remarkable obstacles in their path and journey. About fourteen years ago, I was writing a lot of author profiles about different authors. Reading through a news release from a publisher, I learned an author had overcome severe dyslexia yet continued writing. Bodie Thoene's determination as a writer continues to provide inspiration and encouragement to me. Follow the link and you can learn more about it. Or many people have forgotten the personal story of pain that bestselling author Frank Peretti told in The Wounded Spirit, which is one of his few nonfiction books. A couple of years ago I was reminded of this principle again with the announcement of Arthur Miller's death. Through reading Power Line, I discovered this story from the Los Angeles Times (written in 2000) about Miller. The story begins, "If the young Arthur Miller ever thought he was "The Man Who Had All the Luck," he learned otherwise when his play with that title closed after only four performances, in the playwright's Broadway debut in 1944." and it ends with some interesting insight for writers in this quote from Arthur Miller, "Every play has a secret. This one has a deep one. It's a combination of fantasy and reality--and you've got to strike the balance just right." Or make sure you catch this phrase in the lead paragraph of the MSNBC story about Miller, "Arthur Miller never stopped writing." His early experience in playwriting could have discouraged him to the point that Miller quit writing. Instead, he pushed beyond this experience and joined the overcomers. It drove him to write plays like "Death of a Salesman" and "The Crucible." I appreciated the insightful interviews with writers which Terry Gross put together last year in her book, All I Did Was Ask : Conversations with Writers, Actors, Musicians, and Artists. Like almost any book of this nature, the overcomer theme was throughout the pages. Each of us face our own daily challenges in the writing life. If you need encouragement, possibly you can find it in Marvin Olasky's article, How to Become A Good Writer. Are you choosing to persist and overcome? Possibly the painful experience of the present (or your past) can become something precious for your writing. It is in my life. W. Terry Whalin understands both sides of the editorial desk--as an editor and a writer. He worked as a magazine editor for Decision and In Other Words. His magazine articles have appeared in more than 50 publications including Writer's Digest and Christianity Today. Terry has written more than 60 nonfiction books including Book Proposals That Sell. See more about his writing at www.right-writing.com/whalin.html. For more than 12 years Terry has been an ECPA Gold Medallion judge in the fiction category. He has written extensively about Christian fiction and reviewed numerous fiction books in publications such as CBA Marketplace and BookPage. He is a literary agent at Whalin Literary Agency, LLC. Terry and his wife, Christine, live in Scottsdale, Arizona. Are you looking for a way to "escape" the 9-to-5 rat race? Do you feel chained to your desk - at a job you don't like - by the reality of having to earn money? Most of us trade our time for money. We may make a very nice living doing that ... but we are never truly free as long as we punch a time clock - or have a boss telling us what to do. We have to get up early in the morning every day ... commute in the cold and dark ... and put in long hours making money for someone else. But now, Bob Bly has discovered a safe, sure-fire way for you to completely retire - within 18 to 24 months from today - even if you haven't saved a dime for retirement. In his new audio program, "The Internet Marketing Retirement Plan," Bob will show you how he did it. Wouldn't you like to be in a position where you can do anything you want each day - rather than having to get up early and commuting to work every morning? To discover the 3 simple steps to building an online "retirement income" just click here now. After brainstorming a great new idea for a nonfiction book, one of the most important questions to ask yourself is "What can I add to this topic?" To find out, you must check Amazon.com or take a trip to a couple of bookstores to find out what's already been published about your subject. Agent Djana Pearson Morris says, "Take a serious look at the competition-- if someone's already done it well, or if there's a glut of books on the subject, this may not be a book that will be able to stand out in the market, hence it will be of little interest to publishers, regardless of its attributes." Pay no mind to the out-of-print books, vanity-published titles, or e-books, because traditional publishers won't consider them competition and general readers are unlikely to have read them. But do pay close attention to anything that's on bookstore shelves today. Ask yourself if there's a need and a demand for more information on the topic. For example, even if you have great insights to add, the world probably doesn't need more than one book about how to properly water a fern. Sure, I'm using an absurd example, but if your book has a limited potential audience, how hungry is this audience for new information? Would anyone buy two books about how to water a fern? If not--and bookstores already stock one--stores will be unlikely to stock a second one. "We already have a fern book," they'll tell the sales rep. "What else have you got?" Some topics, however, have dedicated audiences who will happily buy more than one book, provided the books each offer something the others don't. Take my latest book as an example--Make a Real Living as a Freelance Writer. I knew there were already plenty of books about freelance writing. And just the fact that I was going to write a book on the topic in my own style would not be good enough. Just the fact that I could use some personal examples that the others hadn't was not enough, either. Publishers knew it was a crowded market, but they also knew that writers don't need just one book about freelance writing; it's likely that they'll read a handful of books on the topic, and it's worthwhile for them to do so. There are plenty of ways to be successful as a freelance writer, and different perspectives on how to break in or to stay successful. So my job was to convince a publisher (and readers) that my book would offer something substantively different from what the other books offered, or that I would take over where other books left off. There would be some required overlap, of course--you can't write a book about magazine writing without ever explaining what a query letter is or what types of rights a publication may buy, so you'll probably find that in every book for magazine writers. But the key to selling my book was figuring out what I could add to the already-vast mounds of literature on the topic. I realized that I found my success as a writer somewhat differently from the other authors I'd read. I had broken most of the rules in the other books for writers, and I had bent the rest of them. And I realized that, at the time I proposed it, no other book for freelance writers had current information about the way magazines "really" worked since the Internet came along. No one else was discussing e-mail queries or how to figure out an editor's e-mail address. No one was addressing the issue of how to send out clips electronically, or what sites to visit to find interviewees and experts for articles. On top of that, nearly all of the books were meant for beginners. I couldn't find books that reliably showed me how to go from getting my first few credits to moving on and actually making a career at it--becoming a columnist or a contributing editor at a major magazine, for instance. So in my proposal, I stressed the things I would add: a more timely perspective, an alternative to the rules other books laid out, and a slant toward the intermediate writer rather than the beginner. As an author, you don't just do these things because it'll help you sell a proposal to a publisher; you also do it for the reader. I've been mighty frustrated when I've spent hard-earned money on a book, only to find that it regurgitates the same information I've found in other books, magazines, or online. Your obligation as an author is to cherish your readers, and to make them happy with their decision to buy your books. Otherwise, don't expect them to follow you to the next book, and don't expect to build any word-of-mouth buzz. A few chapters of new information in a book that's otherwise filled with information easily available elsewhere just isn't enough to justify the cover price of books today. So, aside from your (certainly engaging) writing style and personal anecdotes, how will you add to a reader's knowledge in a way that justifies the hard work he put in to earn the money to buy your book? - Can you slant it for a specific group of people within the category's market that the others haven't? For example, while there were plenty of books for screenwriters on the market, there weren't any geared toward young people--so Christina Hamlett wrote ScreenTEENwriters just for them. - Can you talk to people who disagree with what "experts" have said on the topic? - Can you find out recent developments that have changed the accuracy of information in other books? - Can you offer a significantly different perspective on the topic? - Can you perform real-life experiments that show the results of theoretical discussions in other books? What makes your book different is what makes it important. Ask yourself what you can add, and you may just have yourself a bestseller in the making. Want To Get A Book Published? "Some day I''m going to write a book." Over 80% of people plan to write a book and more than six million of them have already written a manuscript. Admittedly there are dozens of companies who will take your money and publish your book. How do you get a book publisher to pay you for your book? Former book acquisitions editor Terry Whalin says editors and publishers don''t read manuscripts. They read book proposals. 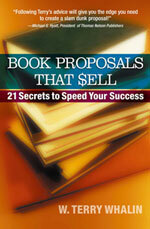 In BOOK PROPOSALS THAT SELL, 21 SECRETS TO SPEED YOUR SUCCESS, you learn the inside scoop to achieve your dreams. Robert McGarvey needed a little arm-twisting before he'd get on a plane to New York to meet his editor at Warner Books. The Los Angeles-based writer didn't see the point of flying 3,000 miles to get chummy, when he'd already ghostwritten one book for the company and believed that more work was in the offing. But his agent persisted. "Look, he really likes your work, and he wants to do some more stuff with you. Why don't you come meet him?" he told McGarvey. McGarvey's glad he gave in. After the trip, "Warner gave me a multibook contract that was worth $30,000," he says. "My mantra is 'build relationships.' Meeting people in person is one way to start." He's now convinced that face time can transform any writer's career. No matter where you live or what you write, you'll reap financial and professional benefits from meeting your editors face to face. Here's why. "Putting a face with a name and/or voice can go a long way toward establishing an even better working relationship," says Alabama-based Judy Woodward Bates, a speaker and author of The Gospel Truth About Money Management (New Hope), who makes a point of meeting with her editors as often as possible. Even busy editors welcome the opportunity to meet their writers. According to Leah Ingram, author of The Complete Guide for the Anxious Bride (New Page Books) and other books, "When I was editor at Moms on Call [a former special-interest magazine from Woman's Day], three writers who didn't live in New York made it a point to visit me. It was absolutely not an intrusion. Editors are very isolated, spending their days with their computers. To have flesh-and-blood come to your office is a nice change that makes the editor feel good." Some writers worry that such meetings could work against them. They're apprehensive about being judged on their weight, age, clothing or appearance. "There are two camps of writers," says Ingram. "One sees writing as a hobby; one treats it as a business. The fact is, face-to-face meetings can help grow your business. As an editor, it didn't matter to me how old or how heavy a writer was, what color her skin was or where she lived. What mattered was whether she had good ideas and could meet deadlines." "When you meet your editors in person, you can ask silly questions like, 'Do you prefer first-person or third-person stories?' and get a better feel for what they're looking for in a query," says Virginia-based Sharon Cavileer, a magazine and newspaper freelancer who specializes in travel stories. Cavileer tries to visit at least half of her editors regularly, and she always leaves the meetings with additional work. "Visiting editors has doubled the number of assignments I get," she says. "During our discussions, they might say, 'Gee, you know, I've never done anything on ____' or, 'Do you know anything about ____?' " Cavileer sees such comments as her opportunity to jump in and sell herself—and nab another assignment. When I visited a Colorado-based book publisher I'd done freelance editing for, I hoped simply to solidify my relationship with a company that had recently undergone major changes in ownership and staff. While discussing with the publishers and editors the types of projects I enjoyed, the conversation led to an editing assignment they hadn't thought I'd be interested in—an assignment that paid four times more than any previous work I'd done for them. That's not all. After a couple of hours, we started talking about the kinds of books I'd like to write. The editors liked five books I pitched, and I left the meeting knowing which ideas excited them most and exactly what they were looking for in a proposal. Six months later, I had a contract in hand for my fourth book, Your Perfect Job. Clearly, it was worth the nearly $1,000 in airfare for me to make this quick, two-day visit. While meeting editors is likely to yield immediate positive results, it can also pay off in the long term as editors move on to positions at other publications. No matter where they might end up, when editors need writers, they tend to hire ones they've established a rapport with in the past. When should you meet your editors? The sooner the better. "If you've had minimal dialogue with an editor—even if it's just a personalized rejection—arrange a meeting. It can't hurt," Ingram says. Consider the approach taken by Los Angeles freelancer Kathy Sena. When she's planning a trip to New York, she sends notes to a few editors a week or two in advance. "If it's an editor I haven't worked with before, I usually include my credits, a few clips and a letter of recommendation from another editor. If I have worked with the editor, I may suggest lunch or a quick trip to Starbucks." Although Sena will do cold calls, she makes it a priority to connect with editors she's queried but not yet worked for. "Chances are, if your clips are good, you'll get at least a 10-minute 'show-me-what-you've-got' meeting," she says. If you meet an editor at a writing conference, recognize that a brief introduction in this setting can't substitute for meeting at her office or at a coffee shop. Editors are besieged at conferences, so you'll be competing for their attention against other writers making pitches, colleagues catching up and networking, as well as the general information overload that occurs at these events. Your best chance for real discussion and a lasting relationship is to arrange to meet away from the conference setting. However, if you're attending a conference in your editor's city, use that as an excuse to request a personal meeting. • Do find out beforehand how much time the editor has to spend with you. The time frame indicates whether you should be prepared to pitch story ideas or just say hello. • Do dress professionally. You need to make a good impression. Don't show up in sweats or jeans, even if you're meeting with an editor who specializes in fitness or adventure travel. • Don't come bearing gifts. Most editors aren't allowed to accept gifts. Moreover, you'll probably come off looking desperate or naive. Of course, you could think up a dozen good reasons not to scrounge up the airfare or waste your time schlepping around some strange city just to meet editors on their own turf. But don't let these excuses keep you from advancing your career. According to freelancer Sena, "We're in a business that thrives on making and maintaining good relationships. A writer can't afford to pass up these great opportunities." And nothing will benefit you more than putting yourself on an editor's short list of writers who care enough about their work to get personal. Robert Bittner is a full-time freelance writer specializing in books and magazine articles on a wide range of topics. His fourth book, a career guide for recent grads called Your Perfect Job is available now. Also recently he has been writing for a variety of publications, including: Chicago Tribune Magazine, USAirways' Attache, Ladies' Home Journal, PAGES, The Writer, Writer's Digest and others. You can learn more at his website: http://www.robertbittner.com/. © 2007 Robert Bittner.All rights reserved. Used with Permission. We all know that business is incredibly competitive today. It's important to be good at your craft and deliver superior service, but these things alone are no longer enough to ensure your continued success. Those who make the most money in any field, industry, or profession are not necessarily those who have the most knowledge, are most experienced in their craft, or sell the highest quality service. No, those who make the most money, charge the top fees, and are constantly in demand are those who are best at selling and marketing themselves! It doesn't matter what you are selling - professional, creative, trade, or technical services - or what your profession is. Bob Bly’s 5-step Selling Your Services process is packed with business-building selling techniques that will enable you to gain the selling skills you need to be more confident in selling, enjoy it more, generate a flood of leads and inquiries for your services, stand out from your competition, and get more and better clients to hire you, more often, for bigger fees. Now YOU can increase your personal income $100,000 to $200,000 a year or more - simply by becoming much more effective at selling your services to potential clients, at the fees you want to charge. For more information, on this audio program, combined with 2 FREE BONUS CD’s, click here. We often jump into a new writing project without much thought. Driven by passion and fueled by the excitement surrounding the creative process, we dive in. Sometimes, this is a terrific strategy. Pour out what's in your heart; try to make sense of it later. Other times, you simply waste your time by not answering a few preliminary questions. If you're serious about a book project, it will serve you to clarify your intention with the following. Before you lift a pen or fire up your computer, there are a number of critical questions you'll want to answer. This little exercise will help clarify why you are about to invest hundreds of hours into a potentially agonizing—yet rewarding —process. 1. Why do you want to write this book? What do you think the book will give you? 2. What is the purpose of the book? Why do you feel compelled to write it? 3. Who are you writing this book for? What kind of person will pull it from the shelf? Accurately pinpointing your audience in advance can determine your book's salability to a publisher and ultimately, to the market. 4. Why will someone want to read it? What need / problem will the book address and how will the book help the reader? This question assumes you are writing a nonfiction book. Again, know your market. 5. Has your message already been said? What's unique and remarkable about your message? Do some market research in your local bookstore and / or at Amazon.com. We'll get into this further in the next section. 6. How does being an author fit into your overall career? Take twenty minutes or several days and soul-search the answers to these questions. It is the best time you can spend. The above article is an excerpt from the guidebook included in Everything You Need to Know to Become a Best-Selling Author. In this program, Dr. X and Scott Jeffrey guide the listener step-by-step through the Book Proposal process with clear illustrations throughout. In this just-released program "Ultimate Direct Response Secrets," a top Internet marketer and a veteran direct mail copywriter -- Fred Gleeck and Bob Bly -- share their combined 4 decades of marketing experience to enable you to increase your marketing response rates as never before. In Part I of "Ultimate Direct Response Secrets," Bob Bly, who has been paid millions of dollars during his career to write promotions for Phillips Publishing, Boardroom, Nightingale-Conant, Institutional Investor, and dozens of other companies, shares with you the "best of the best" of his arsenal of proven direct response techniques. Next, in Part II of "Ultimate Direct Response Secrets," Fred Gleeck – known to tens of thousands of marketers as "The King of Content" and "The Product Guru" -- shows how the Web can drastically reduce your marketing costs while multiplying your sales. In all, you'll get dozens of powerful marketing tactics and tips – professionally recorded on 5 long-playing CDs, plus 3 bonus CD's for a total of 8 in all. For more information, use this link..
During spring break we always visit my husband's parents in southeast Florida, in an area populated by legions of World War II-era Jewish retirees from New York. One day we were at an indoor flea market, and I noticed a man selling big Kosher pickles from barrels. The sign behind him read: Eat a pickle while you shop! "I wonder if he puts the pickles on a stick," I said to Jon. Sure enough, as we watched, an elderly woman approached, pointed to the half-sours, and was handed a pickle speared like a Popsicle. I turned to my husband. "Now there's something you're not going to see anywhere else," I said. If my life was a story, this incident would speak volumes. None of the resident shoppers seemed to think a pickle on a stick was unusual; they either walked by or nonchalantly ordered one the way I'd order a cup of coffee. But that pickle stand firmly placed the flea market in a Jewish community. And my reaction to it labeled me as an outsider— growing up in the Midwest, I was more likely to eat a hot dog on a stick than a pickle. When writing, a well-chosen detail needs no explanation. It can give texture to a setting and establish a character's relationship with her surroundings. The author doesn't need to elaborate for the reader ("I've never seen anyone eat a pickle on a stick before," said Laura. "They don't do that where I come from. These people must have a different cultural background than me. "), or even dwell on the detail for more than one sentence. Plant it and move on. Trust that a good detail will do its job, giving life to the scene playing out in the reader's imagination. Some details are more important than others, and it's often the significant details that are hardest to subtly work into the text. With historical fiction, the author wants to show daily life from a different time and place, but can't have the characters remark upon it ("Look! People riding horses down the street! It must be because they have no other mode of transportation."). The details have to be brought to the characters' attention through the plot ("Look! That horse just splashed mud all over my new petticoat!"). Other details are so crucial that changing them affects the entire story. In Gary Paulsen's novel Hatchet, 13-year-old Brian Robeson is marooned in the Canadian wilderness after a plane crash. All he has are the clothes on his back and a hatchet. Paulsen knew he had to give his protagonist a tool in order to survive, but a hatchet— as opposed to, say, a Swiss Army knife— provides Brian with the minimum of what he needs (a means to start a fire and build other tools) and nothing he doesn't (a can opener, screw driver and toothpick). It forces Brian to remain as close to nature as possible. If Brian survived the plane crash holding a rifle, he'd then have a weapon instead of a tool, and his relationship to his surroundings would have been very different. But it's just as important to carefully choose the background details. In Denise Vega's novel Click Here the protagonist and her best friend try out for the school play. The tryouts and play itself are minor plot points, used to illuminate larger issues going on in the book. Jilly lands the lead role, while Erin (the main character) is cast as an ear of corn. This beautifully illustrates how each girl feels about herself early in the book, and who holds the power in the relationship. In the short texts of picture books, each detail affects the illustrations as well as the plot. Because authors have fewer words, many details are implied. In Wilfred Gordon MacDonald Partridge by Mem Fox, illustrated by Julie Vivas (which I often use as an example of a near-perfect picture book), Wilfred is a small boy who is trying to help his elderly friend Miss Nancy find her memory. He asks several people in the retirement home what a memory is, and they give him different answers (something as precious as gold, something that makes you laugh, something that makes you cry). Then Wilfred searches for things to give Miss Nancy that embody the qualities of a memory. When he gets to "something warm," Wilfred goes into the hen house and takes a "fresh, warm egg from under a hen." Nowhere else in the story does Fox describe where Wilfred lives, but this detail shows the reader that his home is in the country, or at least rural enough to have a hen house in the backyard. If Wilfred had instead walked down to the beach to find a warm stone in the sand, the illustrations would have had an entirely different feel. So consider your details carefully when you write. Every image, large and small, can create a lasting impression on the reader. Because sometimes a pickle is more than a pickle— it might be a tasty snack on a stick. Copyright 2007, Children's Book Insider, LLC.